For the first time in 160 days, the Flames returned to the ice on Friday night, opening up the Young Stars Classic rookie tournament with a 4-1 win over the Winnipeg Jets at the South Okanagan Events Centre. I heard rumblings leading up to the game that Matthew Tkachuk and Brendan Lemieux were not necessarily fans of each other and that their Dads were also longtime adversaries who fought each other in the World Cup 20 years ago. Sure enough, seven minutes into the game, the two got after each other after an open-ice hit attempt with Keith's kid ending up standing over top of Claude's kid, who was down on the ice, and laying the lumber to him repeatedly. Tagged with elbowing and cross-checking penalties for that incident, Tkachuk was back in the penalty box again in the second period for a play that was called high-sticking but could have been a slash. Later in the second with a scrum in the crease, there was Tkachuk on top of the pile again, getting in some more shots. Then there was a mini-brawl with five minutes left that saw everyone on the ice banished to the dressing rooms. Once again, Tkachuk was in the middle of that, picking up a misconduct for his efforts. 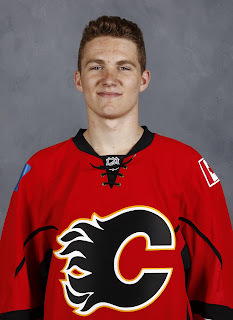 It only takes you about two seconds to realize there is an edge to Tkachuk's game, which is an ingredient sorely lacking in Calgary and will be a welcomed addition when the young man is ready. Sixteen penalty minutes in his first game in Flames jersey is double the number of penalty minutes Sean Monahan had in his entire first season with Calgary. In that respect, these two sixth picks are nothing alike. 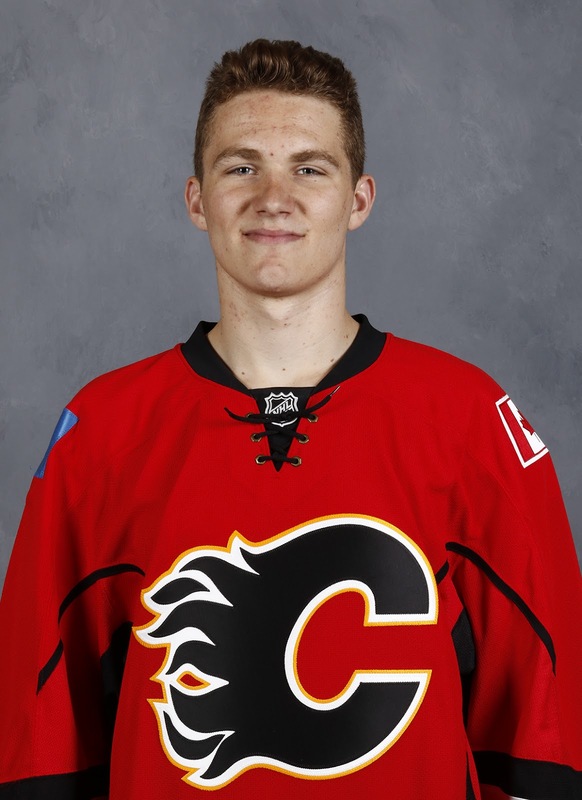 "It was fun to get back into the swing of things," said Tkachuk. "That's what we miss from being off for so long are games like that where they're chippy. That's the game I like to play. Flirt with the line, I guess I went over a couple times today, but we got the win." "I like playoff-like atmospheres and those chippy games, those games where it's low scoring and one-goal games. I thrive in those and I felt like today was one of them," added the 18-year-old.. It was the first time coach Ryan Huska had seem him play live. "He's got a presence on the ice. He's a different player that I saw in practice. When he plays the game, he drags people into the game with him," said Huska. "He plays hard and he's in people's faces. When the puck is at the net, he's always at the net. "My takeaway from this is if you're going to play with Matthew, you have to be engaged in the game because he's going to be around it all the time. That's what makes him a special player and why he's had success over his last couple years." Entire post-game interview, Matthew Tkachuk didn't stop smiling once. Loved the intensity of tonight's game. He's going to be fun to watch. Not sure where the Jankowski skeptics club is holding their monthly meetings these days but they can probably start making plans to re-locate to a smaller room. Jankowski and Tkachuk were good together on that top line and created tons of chances. 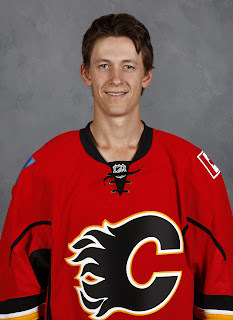 Playing in his first actual game in a Flames jersey, nearly 51 months after being drafted 22nd overall in 2012, Jankowski could have had several goals and him and Tkachuk formed a dangerous combination. "We had chemistry right away and with Austin Caroll too," said Jankowski. "We were all going pretty well and we all kind of fed off each other and off our energy." Tkachuk was complimentary of Jankowski's game. "Really good player. Big body, made some great power moves today. It took us a couple shifts to realize where each other were going to be but by the end, we were really using each other." After I spent the afternoon writing about Morgan Klimchuk and his quest to start off his second pro season with a bang after he was held to just three goals last year, and how he was going to play on the top line tonight, he ended up a late scratch. "Tweaked his groin after the pre-game skate," explained Huska. "It's a funny thing. These guys want to play really badly but sometimes you have to make sure you put them in the right positions. Hopefully he's feeling great tomorrow and he'll be in our line-up tomorrow." The beneficiary was former Victoria WHLer Austin Carroll, who jumped from the third line all the way up to the top line with Jankowski and Tkachuk. Halfway through the first period, Carroll was set up neatly in the slot by a tic-tac-toe passing play by his linemates. Denied on that chance, he did get a goal later when he deflected a point shot from Keegan Kanzig. 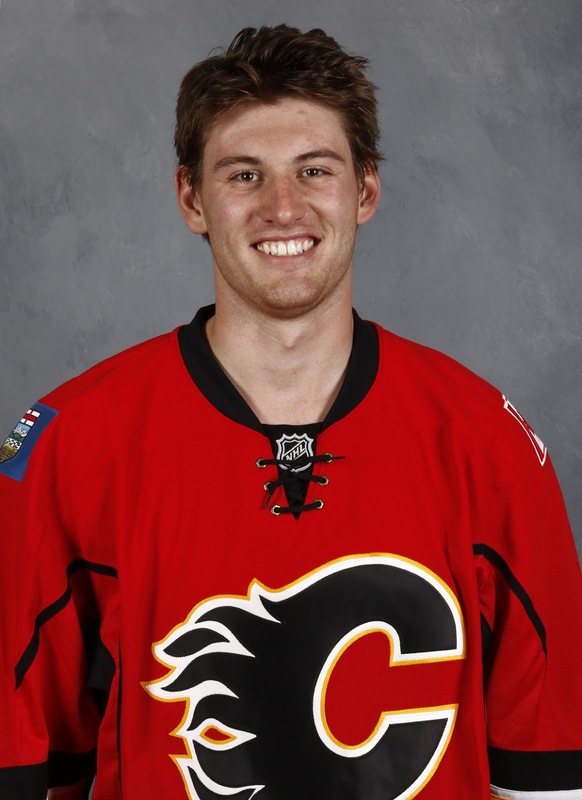 A Flames seventh round pick in 2014, Carroll is entering hs second pro season. He has an interesting skill set in that he has size at 6-foot-3, 215 pounds, he shoots right, and in junior, he scored 30-plus goals his last two seasons. Making it to the end of his first game was Ryan Culkin and just that had to feel good considering a year ago in the same opening night match-up against Winnipeg, he ended up sidelined for two months after separating his shoulder. That night last September, he was wearing an 'A' as alternate captain too, just like he was Friday. "Last time I wore a letter was when my shoulder came out, so I knocked on wood, said a few prayers, but it was good to get my first game under my belt and I'm looking forward to the rest of the weekend." As his story goes, and you can read the full version here from last week, he ended up spending three months in the ECHL upon his return from injury last November and as a result, he admitted he battled "mental depression". But now he says he's feeling good about his game again and his play Friday reflected that. "I'm relieved right now," Culkin said after the game. "I just wanted to keep it simple and I definitely felt good, I felt really confident." In one play, he made a confident behind the back move behind the net to calmly evade a forechecker. He showed some offensive savvy in one sequence with a nice slap-pass that almost was tipped-in perfectly in front. He also jumped into the play several times, wheeling around in the offensive zone as he can being the smoother skater he is. "I wanted to stick to my game but who doesn't like to join the rush and create some offence? If a couple bounces went my way, maybe I would have got a goal or two, but I felt good." The Flames roster for rookie camp boasts 16 skaters that are over six-feet tall with four of them 6-foot-7, yet the first three goals came from guys 5-foot-10 or shorter. Tiny 5-foot-7 Matthew Phillips scored the Flames first goal. A shot from Kenney Morrison hit him in the chest and after it dropped to the ice, the Calgary kid backhanded it in. A good forecheck from Eetu Tuulola forced a turnover on the second goal with 5-foot-10 Andrew Mangiapane pouncing on the loose puck in the slot and ripping a perfect shot into the top corner from 30 feet out. Ryan Lomberg, 5-foot-10, who is another agitator type and was noticeable for those reasons as well, scored Calgary's third goal. He fired in a Tuulola rebound that came after a Mangiapane rebound initially. "It's fun, it's hockey, right? All the guys are excited to get back after it and it showed," said Lomberg afterwards. "Ultimately whey I'm here is to create energy and make sure people look over their shoulders every time I'm on the ice." Huska coached Lomberg for part of last season so he's familiar with his play. "Ryan is a great story. He wants to play maybe more than anybody. Tonight, one of the challenges for all the guys is to make sure people notice you and I think everybody in the rink noticed him tonight, both with his skating ability -- he scored a greasy goal in front of the net -- but every whistle he was involved tonight," said Huska. "I think probably most of the guys on the other side were tired of seeing him on the ice. For me, he was one of the most noticeable players on our side." The Jets struck first when Jansen Harkins, on a two-on-one with Kenney Morrison defending, looked off his linemate and snapped a shot inside the goal post on Gillies' blocker side. But that was it. Gillies didn't give up another and while he was less busy than the Jets goaltending tandem -- the shots were 40-22 for Calgary -- he was solid when needed. On a second period power play, Gillies flashed some leather in throwing up his trapper to pluck a shot from Kyle Connor from the slot and keep the game tied. "He was good. You could maybe say there was a little bit of rust early on, maybe a bit off angle on that goal or so it looked like from the bench, but from that point on, he was the Jon we saw in Stockton. You get a feeling when he's on like that, you're not going to score on him." Gillies had shutouts in two of his first seven pro games last season with the Heat before he ended up undergoing season-ending hip surgery. With Brian Elliott and Chad Johnson entrenched as the starters in Calgary this year, Gillies will be the No. 1 goalie for Huska in Stockton. Flames are back in action on Saturday night when they host the Edmonton Oilers. Really noticed Mangiapane's speed and Killington as well. Thought Jankowski looked good. Didn't think Anderson played all that well.